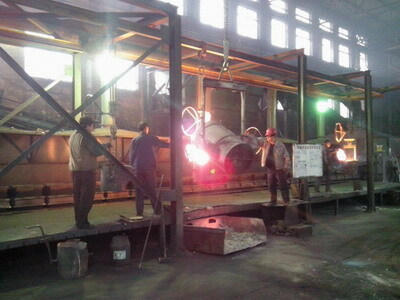 The followings are the main casting processes and foundry equipment in our casting workshop. 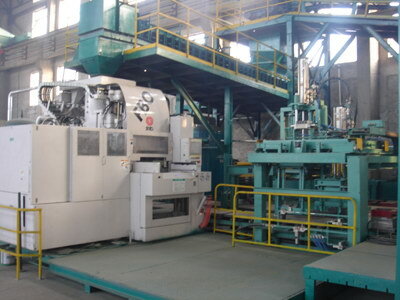 The FBO III Automatic Molding Line is the international advanced horizontal parting and removable flask shoot and squeeze molding line imported from Japan, it can produce 120 cases per hour, and it completely get rid of heavy producing situation, it improves the casting production to the sufficiently automatic level, it also make our casting parts' inspection reach an advanced level of international standard. This is the workshop for lost wax investment casting, and this casting process could be used to produce cast steel knife points. 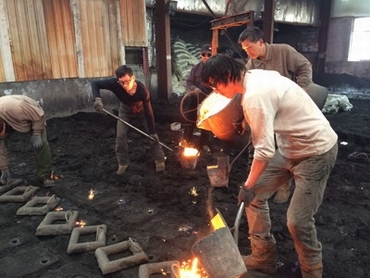 The investment casting foundry uses the yellow wax and water glass as the materials. The lost wax process makes the castings to keep the surface and inside inspection, and relative low cost. 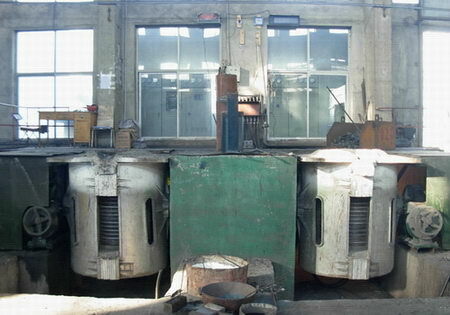 Most of metal foundries in China mainly used this lost wax casting line to produce steel castings. 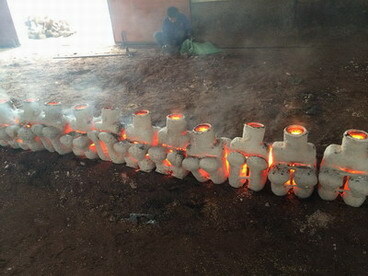 Only some could produce iron castings by this process. The resin bonded sand molding line was supplied by Qingdao Wuyang Casting Machine Company, its capacity of mulling is 30 tons per hour, and it adopts the combination of centralized control with on-site control. 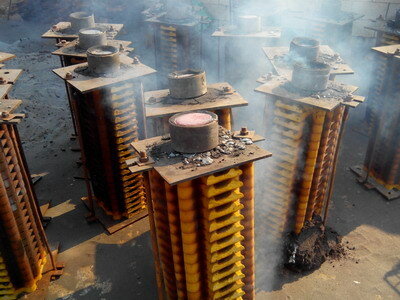 In addition, it sets secondary magnetic separation, secondary sifting, and twice dust removal device, which can ensure the inspection of sand mulling and the work environment of civilized production. Currently, we are using the machine molding line to replace the tradional manual molding method. 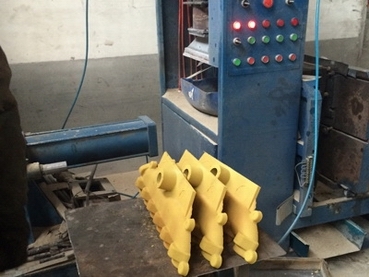 Machine moulding could garantee the same moulding pressure, and stable moulding quality, so to produce iron castings with stable dimensions and quality. 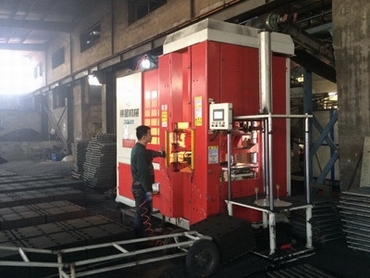 The molding machine has some difference with automatic molding line. 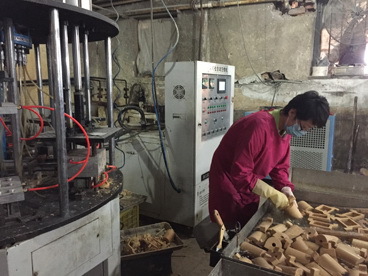 In this process, we only use molding machine to complete moulding process, so the workers need to remove the sand moulds to other places for the following processes, such as pouring hot liquid iron and clean the sand. So, the hot iron could be kept in the sand mould as long as we need. We could break the sand mould when the iron has become very cool. However, this is almost impossible to be completed by automatic molding line.